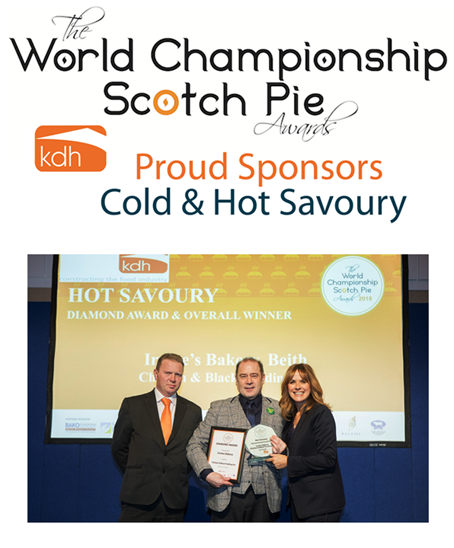 KDH Projects were proud sponsors of the Hot Savoury category at The World Championship Scotch Pie Awards 2018, which took place at the Westerwood Hotel, Cumbernauld, Glasgow on Tuesday 9th January. Carol Smiley hosted the lunch ceremony. KDH Projects managing director Kevin Haynes presented the coveted awards to the 13 Hot and Savoury winners. The World Championships Scotch Pie Awards was launched in 1999 by proud butcher and baker Alan Stuart with an aim to focus on quality and innovations . Since then the competition has gone from strength to strength seeing hundreds of Butchers and Backers compete with each other to win the converted title- world Champion Scotch Pie. 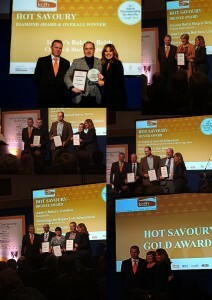 Congratulations to our Hot and Savoury Winners!